Copyright © 1999 Jennifer Fairman, CMI. This image is available for reuse purchase. Jennifer Fairman, CMI, FAMI DescriptionAirbrushed Watercolor and Film Pencil. 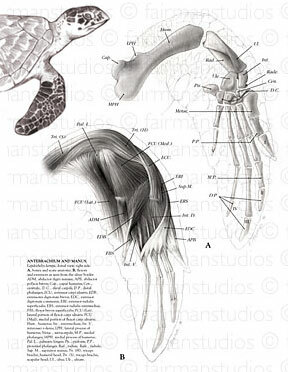 For scientific publication, illustrating the muscular and boney anatomy of the Kemp's Ridley Sea Turtle flipper. Drawn from dissection.